Maximum size: 1.5 mm shell length. Identification: The shells of this species are similar in size to those of Philine orca and Philine rubrata. They differ from the shells of P. orca in being more strongly inflated with a broader apex. They differ from shells of P. rubrata in having punctate striae. Natural history: Philine sp. #3 is known only from shells found in sand samples from depths of 60-76 m (197-249 ft). Taxonomic notes: First recorded in Hawaii from off Makena, Maui by CP from sand samples provided by Mike Severns and PF in Nov. and Dec., 1991. 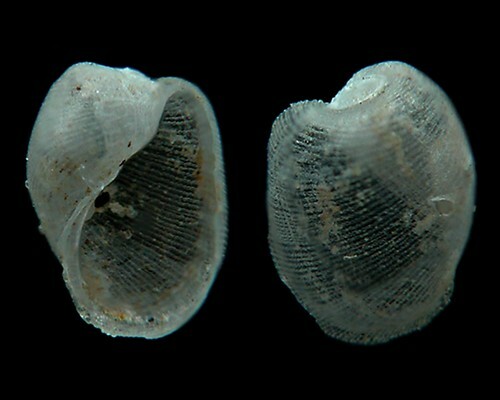 Photo: CP: composite photo, same shell; 1.5 mm: from sand sample provided by Mike Severns and PF; off Makena; Nov. 27, 1991.